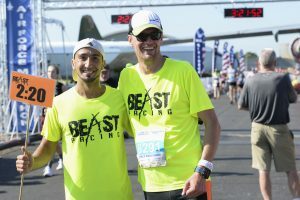 As a benefit to the marathon and half marathon runners, we offer free pace teams led by experienced pacers for a wide variety of times, including many of the Boston qualifying standards. 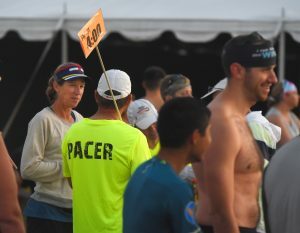 The Air Force Marathon Pace Team members will be available at the Sports and Fitness Expo to answer any questions you may have concerning running with the Pace Team and your race day plan. Pacers will also be at the Gourmet Pasta Dinner to meet race participants. Where will my pace leader be at the start line? Each pace team leader will have a sign that indicates the goal time they are pacing. Large flags at the start time will also have estimated finish times on them. All of our pacers have many years of running experience competing in marathons throughout the country. They were chosen for their actual marathon experience, leadership skills, ability to motivate, encourage and MOST IMPORTANTLY, atheir marathon pacing experience and skills. The best way to select the proper pace group is to consult a Race Prediction chart, like this one at MarathonGuide.com (http://www.marathonguide.com/FitnessCalcs/predictcalc.cfm). There you can base your desired finish time on a previous shorter race you’ve completed this season. It’s very important not to start out too fast in the marathon and to select the proper pace based on your actual previous performance. Are there Pace Groups for the Half Marathon? Yes! 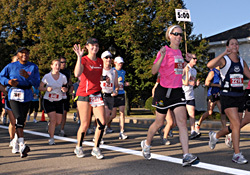 The Air Force Half Marathon has a Pace Team offering experienced leaders. Half-marathoners are welcome to stop by the Pace Team booth at the Expo to discuss your race strategy. Does it cost to run with the Pace Team? No, the Pace Team is sponsored by the Air Force Marathon and doesn’t cost you anything! Should I visit the Pace Team booth at the Expo? Yes. There we will meet with you to discuss your race goals and make sure you’re paired up with the proper pace group leader. You’ll also pick up your pace team bib that will be worn on the back of your shirt. Every pace leader will be holding a steady pace throughout the marathon. These ‘even splits’ are the best way to achieve your peak performance in the race. Will the Pacers start out on pace exactly? How do they do that? The Pace Leaders are very experienced and know their pace well. Sometimes at the start it’s crowded and may take a couple of miles to settle into a steady pace. Most importantly, they won’t start you out too fast and burn up all your energy early on. About 30 minutes before the start they will be assembling in the starting area. Each Pacer will be holding up his or her pace sign, so when you see it go join the group. About 15 minutes before the start the Pacer will give you some last minute instructions about running with the group. They will talk about the course, what to do if you need a break, and how to make it through the water stops. They will be wearing a bright Pace Team uniform. Now is the time to ask any last-minute questions you may have. What will the Pace Leader do at the water stations? The Pacer will usually slow down or walk through the water stops. Listen for this information during the last minute instructions. Will there be Pace Leaders for me if I’ve trained using the Run-Walk method? Absolutely! You can use the Pace Leader as a guide. You will be meeting up with the Pace Leader regularly throughout the marathon, running ahead and then walking behind. No, you don’t. However, if you feel great at the start of the race, that’s normal and you should stay with the group through the halfway point. Then you can consult with the group leader on an appropriate strategy for the second half of the race. If you’re not having a great day then slow down, take some walking breaks and work your way to the finish line. If you’re trying to hit a PR the best advice is to stick next to your pace leader for the whole race. Yes. Each pace group will have one leader and he or she will run the entire 26.2 or 13.1 miles. You won’t be abandoned or handed off to a newcomer in the middle of the race.